Welcome to the best Charles Dance fan zone on the web! This is a site where all fans of the great man himself can gather to enjoy pictures, articles and latest news updates of our favorite English actor, film director and screenwriter of all time, and certainly plays our favorite Game of Thrones character. 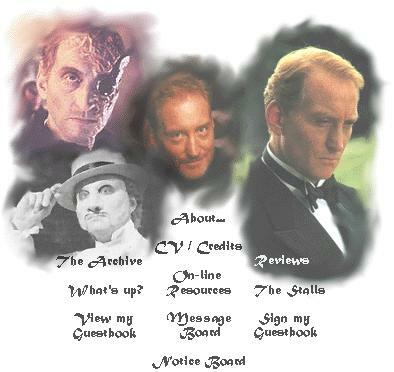 The aim on this site is to provide Charles Dance fans with a one-stop location for everything they could ever want to know about him, and interact with other fans, share ideas and knowledge and generally just enjoy his work. The site will regularly update with the latest happenings in Charles’ career, with photos of him as they come available. If there has ever been something you wanted to know about Charles but didn’t know where to find the answers, look no further. This site will provide all the information you could ever want about Charles Dance, from his early childhood all the way up to his latest roles and appearances. Walter Charles Dance was born October 10th, 1946 in Redditch, Worcestershire, England to a working class family and grew up in Plymouth, attended Widey Technical School for Boys in Cornwall before going on to study at Plymouth College of Art. As many great English actors have been, Dance was an active member of the Royal Shakespeare Company during the 1970’s, appearing in a number of productions. In 1989 he returned to take up the role of Coriolanus in the production of the same name, for which he received outstanding reviews. Dance went on to appear in a great number of British television shows and series, typically in the role of a villain, and in 1981 made his first film appearance in the James Bond movie For Your Eyes Only in which he played the evil villain Claus. In 2004 Dance made his debut as a writer and director when he directed Ladies in Lavender and in 2009 he directed his own version of The Inn at the Edge of the World. In addition to the many awards and nominations he has received throughout his long career Charles Dance was honored to be appointed an Officer of the Order of the British Empire (OBE) in 2006, in recognition of his years in the acting profession. Fans were given a scare recently when a hoax report that Charles Dance had passed away. News spread quickly on social media platforms, with Facebook fans expressing their deep sadness at the actor’s supposed ‘demise’. Dance is just one of many celebrities who have been ‘killed off’ via an internet hoax. Needless to say when confirmation that the actor is alive and well came through fans of the celebrated English actor were very much relieved, with sorrow turning to anger at the lie that had gone viral in a matter of a few short hours. Charles Dance has 3 children; 2 with Joanna Haythorn and 1 with Eleanor Boorman. He currently resides in Kentish Town, North London. If you have a thing for vampires - and who doesn't these days? - you'll be looking forward to seeing Charlie as a fanged bloodsucker of Russian descent in UNDERWORLD 4, due for release in January 2012. In May this year, filming wrapped on the adaptation of Salman Rushdie's 1981 novel, MIDNIGHT’S CHILDREN, which was produced under the title WINDS OF CHANGE. Charlie believes it's due out in February 2012 for the UK/EU; I'm seeing a release date of October 2012 for N. America. Charlie will be in NYC this week doing press for Neverland, a SyFy miniseries "Peter Pan" prequel, which airs on December 4th & 5th in the US. He takes the role of Dr. Fludd. Also in the cast are Keira Knightly as the voice of Tinkerbell, Rhys Ifans as James Hook, and Bob Hoskins as Smee. Looking good! GAME OF THRONES Series 2 has just wrapped. Charlie will continue his role as Tywin Lannister next year, when filming of the next series resumes in Ireland. Say Happy Valentine's Day with the perfect gift for her. Personalized jewellery, flowers, books and sweet treats are always a good idea but why don't you check bestvalentinegift.co.uk for unique gift ideas that will make her feel like a goddess. Happy New Year, Angels! Shall we start it off right with an update? On Monday, 24 January, Charlie will be at the British Library reading Rudyard Kipling for the Josephine Hart Poetry Hour. The price is £7.50 / £5 concessions, the time is between 18.30 - 19.45, and you can book your tickets on the British Library website. In March, Charlie will be heading to Sri Lanka to take part in the film adaptation of Salman Rushdie's Midnight's Children. Then he'll be in Scotland working on the second part of the German TV drama "This September", and later it's to Ireland for the HBO series "Game of Thrones", which premiers April 17. He's busy, well, and sends his very best wishes to the Heavenly Host! Ever have one of those days? I bet it didn't include a traffic warden from hell! I'm pleased to share 'The Commuter', a short film shot entirely in mobile HD on the new Nokia N8 Smartphone and starring Dev Patel, Charles Dance, Pamela Anderson, and Ed Westwick. 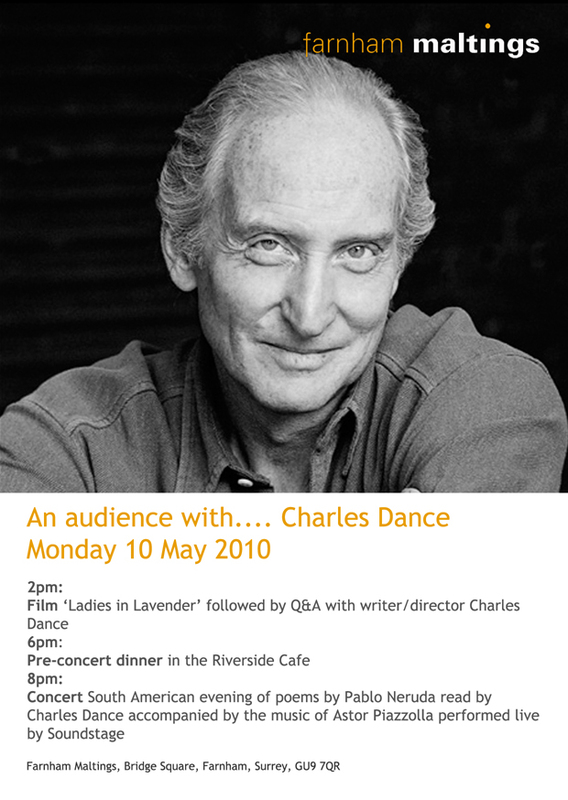 "Charles Dance, the writer and actor, is coming to the Farnham Maltings on 10th May this year. 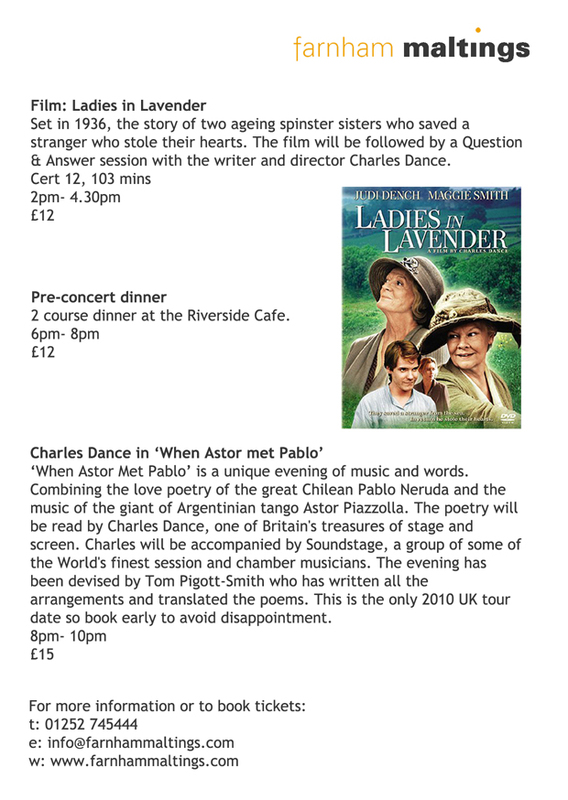 We’ll be showing his film, Ladies in Lavender, followed by a Q&A; with him and then in the evening he will be reading translated poems by Pablo Neruda accompanied with live tango by Astor Piazzolla. I’ve attached a card with the details too. It is a one-off event and really shouldn’t be missed." I'll say! Sadly, however, your faithful webmistress (that's me) will not be able to attend. So if you plan on going, this website would deeply appreciate a report from you...along with any photos you might happen to snap, of course. Further details on the event below.